Additional research provided by Ron Gooding. See also: St. Philip's Church. Brunswick Town was the first permanent European settlement on the Lower Cape Fear River. Founded in 1725 by Col. Maurice Moore (son of James Moore, the royal governor of South Carolina) on part of a 1,500-acre grant, Brunswick was made a township, the seat of New Hanover Precinct, and a port of entry in 1729. Although the General Assembly never met there, the Governor's Council sometimes did; since it was the seat of the colony's executive branch, Brunswick during its early years essentially served as the capital of North Carolina. The town was situated on a low bluff on the western bank of the Cape Fear River near Town Creek, approximately 20 miles north of the river's mouth-a site that was less than ideal because of nearby swamps and exposure to attack but commercially viable since it was accessible by oceangoing vessels. The town was named in honor of George I of England, a member of the German House of Brunswick-Hanover, and its earliest residents were mostly planters from South Carolina and the Albemarle, merchants, and seamen. The town became a center of commerce-with tobacco, lumber, naval stores, furs, and other products being shipped out-as well as the home of a number of prominent persons. Russellborough, home of two royal governors, Arthur Dobbs and William Tryon, stood just outside the town's limits. Brunswick Town originally covered about 360 acres consisting of a commons and 336 half-acre lots organized into 24 town squares. Lots were reserved for a church, a cemetery, a courthouse and a jail, but no formal courthouse or jail was ever built. About a dozen households were reported standing in 1730. St. Philip's Parish was established in 1741, but harsh living conditions and rivalry with St. James Parish in Wilmington left Brunswick frequently without a minister. The construction of St. Philip's Church began in 1754, but because of public apathy, monetary problems, and natural disaster, it was not completed until 1768. In fact, after 1739-with the founding of the upriver port of Newton (Wilmington)-Brunswick Town entered a period of decline. Slowly eclipsed economically by its rival port, it was also beset by other troubles, including the 1748 attacks of two Spanish privateers and a destructive 1761 hurricane. Nonetheless, the town became the seat of Brunswick County when that county was created in 1764 out of New Hanover and Bladen Counties. In February 1766, a peaceful assault on Governor Tryon's home was organized in opposition to the Stamp Act, forcing the resignation of the Comptroller of the Customs, William Pennington. During the early years of the Revolution, Brunswick Town was nearly abandoned, and it was partially burned by the British soon after. When the county seat was moved to a safer location in 1779, Brunswick ceased to exist as a political center, and by 1783 it lay mostly in ruins. Some merchants remained to serve heavy vessels that had to lighten cargo before proceeding to Wilmington due to river shallows, but the deepening of the river channel in later years ensured the town's complete demise. Between 1768 and 1770, a Swiss surveyor and engineer, Claude Joseph Sauthier, mapped ten North Carolina towns. His map of Brunswick is one of those that survives in the British Library, and many of the buildings that he depicted have been marked on the ground. Streets are indicated and the plan and function of this early eighteenth-century town may be studied. During the Civil War, the Confederate army built Fort Anderson on the site. Much of the modern-day Brunswick Town/Fort Anderson State Historic Site was excavated by archaeologists during the 1950s and 1960s. 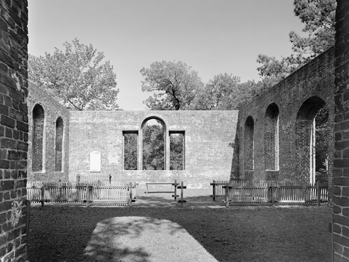 The ruins of St. Philip's Church remain, with brick walls 3 feet thick and 25 feet high. Portions of other businesses and homes exist, as well as the remains of Fort Anderson. A visitors center reveals the history of Brunswick Town through a variety of exhibits and artifacts. 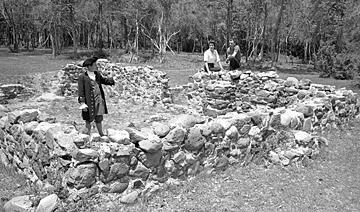 Elizabeth A. Fenn and Peter H. Wood, Natives and Newcomers: The Way We Lived in North Carolina before 1770 (1983). Lawrence Lee, "The History of Brunswick, North Carolina: The Political and Economic Development of a Colonial Town" (M.A. thesis, UNC-Chapel Hill, 1951). Lee, The Lower Cape Fear in Colonial Days (1965). Brunswick Town / Fort Anderson historic site, From the Conservation and Development Department, Travel and Tourism Division Photo Files, North Carolina State Archives, Raleigh, NC, call #: ConDev61-31E. Available from http://www.flickr.com/photos/north-carolina-state-archives/4290044771/ (accessed July 25, 2012).